Derek Gee/Buffalo NewsBuffalo, NY is being crushed with snow. The past couple weeks have given climate change sceptics plenty of events that seem like reasons to dispute global warming. 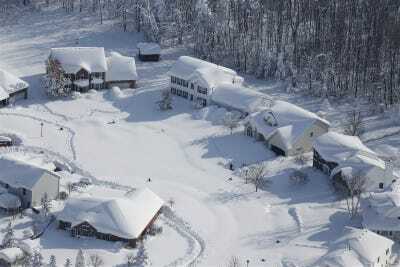 An inundation of wintry weather across the country carried snowstorms and freezing temperatures everywhere from the Pacific Northwest to the Southeast. Most recently, snowstorms in Buffalo, NY have made travel impossible, caused roofs to buckle, and left at least a dozen people dead. Part of the confusion comes down to our understanding of weather and climate. People question the scientific reality of global warming because they don’t know the difference between the two. Weather is what we see day-to-day. It explains changes in the atmosphere over short periods of time and is highly unpredictable. A sudden thunderstorm or blizzard is what we refer to as weather. Climate, on the other hand, describes the behaviour of the atmosphere over long periods of time. Using weather (i.e a few very cold days) as evidence against global warming (i.e a decade of hotter summers) is kind of like using one man’s early death to disprove the fact that, on average, life expectancies are increasing. There will continue to be hot and cold extremes, but when the weather is averaged over time, a clear warming trend emerges. The 2009 State of the Climate Report, compiled by hundreds of scientists around the world, revealed that the first decade of this century was the hottest since scientists started recording data in the 1880s. The current decade is shaping up to be a record breaker, as well. Data just released by the National Oceanic and Atmospheric Administration (NOAA) show that this October was the hottest one on record — and April, May, June, August, and September all broke their own records this year, too. NOAA’s map below shows how this October’s temperatures stack up to average temperatures for this time of year. 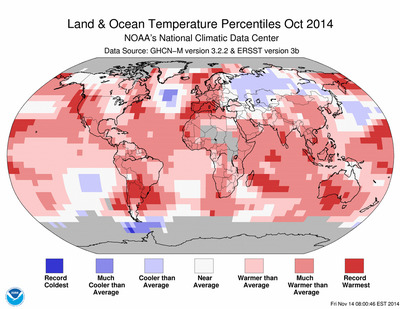 Red areas are warmer than average and blue areas are colder than average. Overall, there is a general warming pattern across the map — and that’s true not just of this month, but of the entire year. 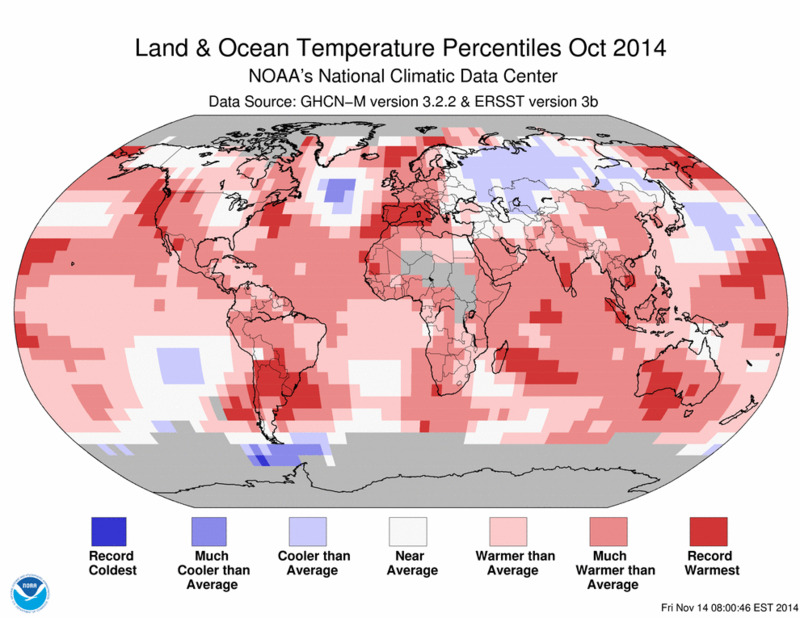 In fact, 2014 is currently on track to become the hottest year on record. But climate contrarians will still protest: “Our climate has gone through huge transitions before!” That’s true. Over the past million of years the Earth has shifted between warm “interglacial” periods and cool “glacial” periods. These changes, however, occurred over long stretches of time and were caused by natural variation in the Earth’s system. The changes in climate that scientists are observing today are man-made, caused by an increasing level of heat-trapping greenhouse gases in the planet. As a result, the warming of our planet is happening on a much shorter time-scale than ever before. In fact, the whirlpool of frigid air, known as the “polar vortex” — which was blamed for last winter’s “eye-popping” cold weather and has been held responsible for some of this month’s frigid conditions — may actually be tied to warming temperatures in the Arctic. During the winter, these winds normally remain locked up over the Arctic. Last winter, the polar vortex made headlines when it became notably unstable (a pattern that was also observed in 2009-2010), possibly because of melting ice and warmer polar winters. The weakened vortex allows streams of the cold Arctic air to break free, flowing into other parts of the Northern Hemisphere. Earlier this month, polar winds were disrupted by a weather event known as a “bomb cyclone,” which rammed into the polar jetstream and sent a flurry of unseasonably cold weather south through North America. According to the Intergovernmental Panel on Climate Change, warming temperatures are likely to cause an increase in extreme weather events around the globe, including the kind of cyclone mentioned above. So while this wintry weather may seem like a sign of hope for the earth, it’s important to note that climate change is capable of producing all kinds of effects. And paying attention to longterm patterns rather than short-term weather events is the best way to find out the truth about what’s happening on the planet.